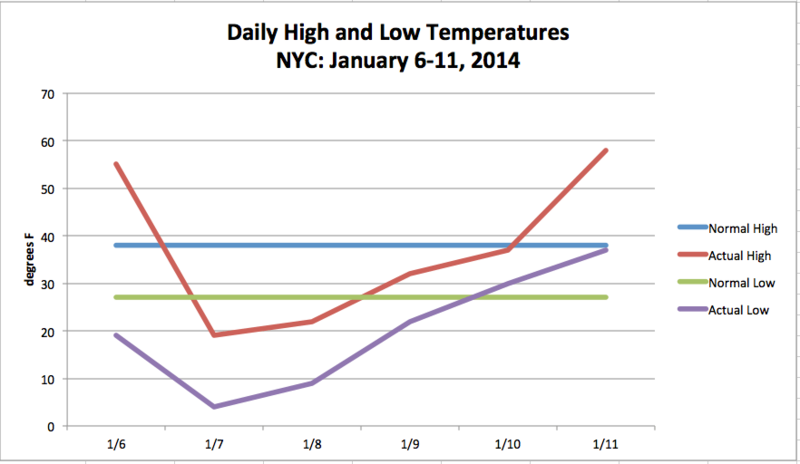 New York City was on a temperature roller coaster this week. From unseasonably warm to brutally cold, we saw it all. On Monday, it was 55°F in Central Park. Then, in a matter of twenty-four hours, from 8 A.M. on Monday to 8 A.M. on Tuesday, the temperature in the city dropped 51°F! With a low reading of 4°F on Tuesday morning, the Big Apple set a new record low for the date. This dramatic change was ushered in by a weakened polar vortex and a deep dip in the jet stream. After a few days of bitterly cold conditions, the mercury climbed above freezing on Friday and then continued to rise. On Saturday, the city’s temperature reached a relative balmy 58°F! Our average high for this time of year is 38°F. From the mid-50s to the single digits and back again in a matter of six days, it felt like weather whiplash! Temperature swings of this magnitude in NYC are very unusual. This entry was posted in weather and tagged cold, extreme weather, nyc, temperature by Melissa Fleming. Bookmark the permalink.